THE ADDRESS is the ultimate digital coffee-table magazine that is dedicated exclusively to international luxury real estate, stylish living, food and travel. 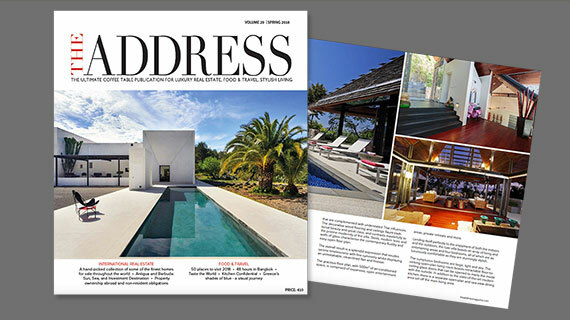 THE ADDRESS Magazine, a leading coffee table publication, has unveiled its Summer 2018 Issue, which features some of the finest luxury homes for sale as well as some of the finest resort homes and residential developments for sale across the globe. A luxury property and lifestyle magazine, it offers stories, news, and insights across several categories of luxury lifestyle, from travel and food to luxury real estate and stylish living. From cover to cover, the internationally renowned luxury lifestyle magazine THE ADDRESS is the very essence of style and sophistication. A must-read for anyone looking for a primary residence or a second home, THE ADDRESS is highly regarded and respected for its editorial integrity and striking design, while offering inspirational and informative insights into all aspects of international luxury real estate. Readers are also introduced to features on food, travel, stylish living and well-being. With 492 pages, readers will find style and substance when searching luxury properties for sale from around the world. In this issue, we are showcasing a worldwide selection of luxury homes for sale, by the sea, city, country, mountain or waterfront. The Food & Travel section has been searching the world for exciting destinations, great restaurants and talented chefs. For a lifestyle of contemporary luxury in the Mediterranean, our luxury San Agustin, Ibiza villa for sale with its impeccable style and sleek sophistication is not to be missed. It packs on the wow factor, as it features striking clean-lined architecture, stunning design elements and sumptuous indoor-outdoor areas. This modern villa with tourist license for sale in Ibiza is ideal for dazzling island living and has great potential for tourist rental. If lavishness, elegance and luxury are what you have in mind, then our featured superlative apartments for sale Montalban 11 Madrid tick all the boxes. Each of these extraordinary residences is an awe-inspiring representation of the ultimate trophy property in Madrid. Enjoying a prestigious blue-ribbon address, the new, exclusive homes are located in the highly coveted neighbourhood of Jerónimos. With its distinguished elegance and indulgent sophistication, these luxury properties for sale in central Madrid make for some of the most desirably trophy homes to buy in Madrid. One of the most exclusive properties for sale in Barcelona, our featured townhouse for sale in Sarrià-Sant Gervasi, Barcelona has been crafted to create a lifestyle of undeniable elegance and convenience. Dating to the 19th century, it is an architectural showpiece with classic magnificence and modern inspiration. Distinguished by its refined sophistication and exclusivity, the collector-quality house boasts uncompromised quality, dazzling interiors and exteriors as well as a private garden. This refined property for sale in Sarrià-Sant Gervasi, Barcelona is rare and unique find, perfect for the most discerning buyer. Limited to only eight luxury houses for sale in Annecy, this exclusive community offers an impeccable lifestyle. With the centre of Annecy at its doorstep, each modern villa is adorned with breathtaking unobstructed panoramic lake views. Beautifully crafted, distinctively designed and endlessly elegant, the designer villas boasts minimalist aesthetics, indulgent comfort and magical outdoor spaces. These modern properties for sale in Annecy give all the pleasures of stylish lake living. Looking for the perfect exemplification of distinctive exclusivity and refinement, then do not miss our prestige Bangkok penthouse for sale that embodies the pinnacle of privileged living. Built with no expense spared, the ultra-high-end indoors and extravagant outdoor areas, make this triplex penthouse one of the most coveted property to buy in Bangkok. From its commanding 38th-floor vantage point, the sky-high residence boasts show-stopping panoramas of the city. With a prized address, this luxury penthouse for sale at Royce Private Residences in Bangkok is the extreme showcase of lavishness and exclusive city living. Our luxury property for sale in Sarrià-Sant Gervasi, Barcelona stands out for its exceptional elegance and style. Dressed in contemporary sleekness and modern-day comforts, the exclusive residence presents a unique opportunity for a discerning buyer who appreciates great design, far-reaching views, enjoys entertaining and aspires to live an extraordinary urban lifestyle. Along with the extreme convenience, modern sophistication abounds in our featured newly built Eixample apartment for sale in Barcelona. Expertly designed and luxuriously appointed, it offers a premium city living experience with high quality interiors, comfortable living spaces and a large terrace. Our new apartment for sale in Pedralbes, Barcelona offers a combination of modern, contemporary design and functional excellence at a prized address. It exudes an ambience of light-filled elegance with fine living spaces and a private terrace. For a dazzling design statement, have a look at our exclusive property for sale near Barcelona in Valldoreix. The modern, clean-lined exterior envelops the space in large glass windows, whilst the expansive interior exudes clean-lined sophistication and indulgent comfort. With cutting-edge architecture, stunning interiors and breathtaking views, our featured luxury house for sale in Altea, Costa Blanca certainly has the wow factor. Within the realm of architectural beauty that sincerely delineates a top-tier stylish lifestyle, the supremely contemporary and flawlessly elegant property is sure to impress. Looking to build your own property in Costa Blanca, then have a look at the article “Building your dream villa in Costa Blanca.” Here you can read how you can build quality, great value new homes in Costa Blanca. With it clean simplicity, modern elegance and sleek architectural statement, what is there not to love about our luxury property for sale in Altea, Alicante. The contemporary villa offers a high level of luxury where stunning aesthetic is duly matched by the captivating beauty of its expansive views of the sea and the verdant surroundings. Nestled in a glorious setting, our superb property for sale in Jávea, Alicante boasts far-reaching views of the beautiful surroundings, backdropped by the Montgó Mountain. With classic beauty and enduring charm, this is an idyllic place for the enjoyment and pleasure of living on the Costa Blanca. Abounding in visual panache, our contemporary property for sale in Moraira, Alicante is distinguished by smart elegance and sleek design. It features spatial symmetry that is finished with a fineness of detail that is stunning yet unpretentious. Designed for a rich, sophisticated lifestyle, our luxury villa for sale in Santa Ana comes with a high desirability factor. The refinement of design and attention to detail create an ambience of exclusivity and luxury. Exclusively designed for a discerning lifestyle, our featured superb home for sale in San Rafael, Heredia, Costa Rica exudes classic elegance and beauty. Generously scaled, it is a spectacular property with luxurious, welcoming interiors, gorgeous outdoor areas and soothing panoramas. An exclusive oasis of elegance and convenience, our beautiful house for sale in Bosques de Lindora, Santa Ana, Costa Rica is a compelling proposition. With polished timelessness and sophisticated comfort, the property is ready for the refined buyer with impeccable taste. Steeped in elegance and panache, our impressive home for sale in Grecia, Alajuela, Costa Rica is the absolute in luxury tropical living. Idyllically set amidst extensive grounds with far-reaching panoramic views, the property is a private escape par excellence. In a stunning fusion of dazzling design and immense lifestyle appeal, our luxury villa for sale in Cala Conta, Ibiza sets a high benchmark in sophisticated island living. With a polished presentation and smart contemporary flair, it is hallmarked by sleek lines, uncluttered space and stylish modernity, all set against a backdrop of wonderful sea views. Set within an elite community, our modern home for sale in Vista Alegre, Ibiza fuses flawless aesthetic appeal and spatial luxury with unwavering comfort. The exemplary contemporary property blends dazzling indoor and outdoor space in a conscious effort to indulge in the gorgeous ocean views. Designed to deliver effortless enjoyment and a stylish atmosphere, our amazing property for sale in Ibiza Town seamlessly articulates luxuriousness and quiet refinement. With a seductively beautiful rooftop terrace the property has endless appeal and is truly a gem. Looking for peaceful, luxurious country living in Ibiza? Then do not miss our large countryside finca property for sale in the north of Ibiza, close to San Miquel. Impeccable in every detail, this exquisitely renovated home simply must be seen to believe. The comfortable and luxurious villa in timeless style is steeped in elegance and gentility that form a setting for a life of privileged distinction . With a blissful hilltop setting, the luxuriously rustic elegance of our gorgeous San Carlos Ibiza property for sale will leave even the most discriminating among us feeling pampered and content. The inviting spaces of artistic aesthetics and classic allure, in combination with far-reaching valley views, make it delightfully liveable. Seductive and beautiful, there are a number of reasons why expats would choose to buy property in Seville. It is a beguiling blend of spectacular architecture, tapas extravaganza, vibrant festivals, rich culture and tradition along with a relaxed, southern Spanish charm. There are also countless magical small towns and villages in the near proximity of Seville. If you are looking to buy property in South of Spain, then have a look at a hand-picked selection of luxury properties for sale in Seville and its surroundings. Timeless beauty and the epitome of gracious comfort best describe our luxury property for sale in Seville, Spain. Simply alluring and elegantly captivating, it is a truly exquisite backdrop for a charmed lifestyle. Aesthetically designed for the joys of luxury living, our modern house for sale in Seville, Spain boasts immense style and flair. With an enviable central address, the sophisticated property is architecturally unique with contemporary interiors and beautifully styled exteriors. This is modern urban oasis for owners who want to live, play, and work in the centre of Seville. For wonderful indoor and outdoor living, our luxury property for sale near Seville, Spain is an expansive home with the grace and charm of yesteryear. It is exquisitely infused with an atmosphere of classic timelessness and discreet elegance. A residence of exceeding charm, our impressive property for sale in Carmona, near Seville is a true delight and a magical reminder of an enchanting era. With an in-demand location, the traditional manor house in the historic centre of Carmona will appeal to the discerning homebuyer who is looking for an enhanced lifestyle near Seville. With 35 metres of ocean frontage, our beach villa for sale at Natai Beach, Phuket offers a pristine setting and cinematic sea views. If Madrid, a city with architectural marvels, world-class museums and Michelin-starred restaurants is on your radar, do not miss our “Where to live in Madrid: El Retiro” article. With a privileged yet peaceful location, Retiro is one of the most historic and sought-after “barrios” in Madrid. It is a residential neighbourhood, next to the elegant Salamanca district, with the beautiful El Retiro Park as a main attraction for its residents. Lovers of nature, sports and, in general, outdoor life will appreciate the allure of living just minutes from the most iconic park in Madrid. Click here if you are looking to purchase a luxury property in central Madrid. Do you have your eyes on a property to buy in the South of Spain? Buying a property in Seville Spain is buying an authentic taste of Spanish life. From streets lined with orange trees and breathtaking architecture, to fiery fiestas and endless number of tapas bars, the exuberant Andalusian capital is as Spanish as it gets. Moreover, with an exceptional lifestyle, buying a home in Seville is a compelling proposition. Our article “There are plenty of reasons to buy property in Seville, Andalusia” gives an in-depth market insight to this amazing city. Buying property abroad can be safe, rewarding, and profitable. Our article “How to stay savvy when buying a property abroad” contains some essential information for anyone looking to buy international luxury real estate. Mistakes can be easily avoided by doing your homework and applying the same common-sense approach you would back home. The article includes some key considerations to bear in mind when purchasing a property abroad. In each issue, THE ADDRESS Magazine takes you around the globe to explore the most exciting stories in food, wine and travel. We will sit down with some of the world’s top chefs, uncover exotic destinations, explore exciting cities, and so much more. Join us and enjoy the journey. Modern, cool, exciting and cosmopolitan: Tel Aviv is one of the most vibrant cities in the world. This beachfront city is all about lifestyle. It combines amazing Mediterranean beaches with a world-class nightlife, a well-curated cultural scene, incredible food scene, UNESCO recognized architecture (world’s largest collection of International/ Bauhaus style buildings), peaceful parks and the historic with its glorious heritage. Tel Aviv should be on your must-travel list. How to make the most of trip to one of world’s most exciting cities, read our travel guide “48 Hours in Tel Aviv”. The distinct authenticity, deep-rooted history and magnetic energy of Brooklyn make it one of the exciting places in the world to visit. It is a melting pot, full of culture, art, music, and food. Food lovers will find here some of the city’s best bars and restaurants, while the many art galleries and music venues showcase the works of creative locals. Other draws include architecture, outstanding parks and epic views of the New York City skyline. It is hard not to fall in love with Brooklyn’s eclectic ambience and diverse offering. Read our travel guide “Brooklyn – time to believe the hype” and see why this New York City borough is a destination in its own right. If you are planning (or even just dreaming of) a world tour of the best food experiences to be found, then do not miss our article “Taste the World – Epicurean Travel”. The article recognises and celebrates exceptional dining experiences around the world. From Hong Kong and Tokyo to Moscow and London, the selected restaurants are sure to satisfy your taste buds in the most aesthetically pleasing ways. “Kitchen Confidential” with celebrity chef interviews and food expert profiles is a standard feature in each issue of THE ADDRESS Magazine. In this issue, we speak to George Blogg, Head Chef, Gravetye Manor, Sussex about his signature dish, his favourite food experience, how to source the best produce and much more. George Blogg also shares two great recipes for you to try: Slow cooked Dingley Dell pork belly with green asparagus, wild garlic, gremolata and cider gel and the Fresh heritage garden beetroot salad with High Weald Dairy cow’s curd, white balsamic and toasted seeds. We have you covered when it comes living well and living in style. Find inspiration and ideas for stylish living and travel, beauty and well-being. Our Curated feature is filled with a hand-picked selection of enviable objects that we enjoy both practically and aesthetically. Our visual journey “The ever-changing tapestry of colours of Provence” is a stunning visual narration that transports you to this incredible part of France. With its magical landscape, vivid scents and seductive colours, Provence is an absolute treasure.